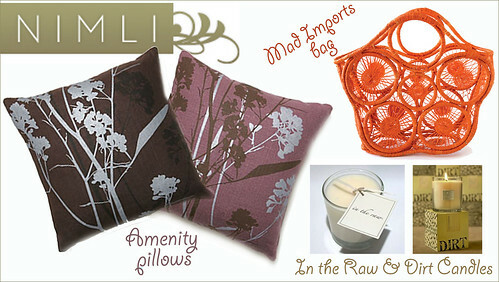 Nimli, a lovely home site: Amenity pillows, Mad Imports bag, In The Raw candle, & Dirt candle. I’m moving this Friday and am kind of freaking out with excitement. I love our new neighborhood in Brooklyn (Prospect Heights Aka P.H. My husband’s name is Dave, we’ve decided to call him P.H.D and open a yoga studio called P.H Balance….joking). It’s right near the park. That means picnics, bike rides, jogging, long walks with the pooch and more. Our new place is so lovely with lots of character. It’s a second floor in a brownstone with original molding, two mantles and nice wood floors. I have so many DIY (or DIM: Do it myself) projects in mind that I’ll post about with pictures of the progress. My recent internet hunts have been for home stuff. In actuality we are not going to get everything I want to get, that would break the bank and we like eating. We’re going to have to get essentials and gradually get more things over time. We want the place to be uncluttered anyhow. I came across this lovely site though called Nimli. They have a home selection plus jewelry, makeup, clothing and more. I ordered the Amenity pillows that I’ve been coveting forever (the copper ones). I think the basket bag would be a great magazine holder and the candles would be great for the mantle. I want it all (my husband just wants his desk)!! Ok, gotta calm down now and go pack about 1,000,000,000 books into big boxes. 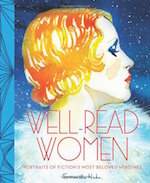 Creature Comfort’s stunning Style & Design blog gallery (with Maquette in it). Plus, Marc Jacobs Mouse flats…too cute! 4 Responses to Nimli, a lovely home site: Amenity pillows, Mad Imports bag, In The Raw candle, & Dirt candle. Awesome products!! I especially love Mad Imports and I carry their purses and handbags in my online boutique. Oh, I’ll have to check your boutique then. That bag is so enticing.